After a lovely stay in Harbour House we were ready to embark on the next leg of our NC500 journey. The destination for today was Lochinver, and the owner of the Harbour House B&B recommended we took the coastal B road via Stac Pollaidh instead of sticking to the A837. We are so glad he gave us the recommendation as it was a extremely scenic route which we both enjoyed! Before heading out to Stac Pollaidh we made a trip to Rhue beach just outside of Ullapool. From where you park the car it’s around a 20 minute walk to the lighthouse, and is a fairly leisurely stroll. I really enjoyed this walk and I managed to get some lovely shots of the lighthouse! Stac Pollaidh is worth a visit as it really is a spectacular view. There is a car park here if you wish to try and climb the mountain. Due to it being 2000ft we decided against trying the climb. However I later read online that it’s considered an easy climb for any relatively fit person and should take less than 3 hours. If you have the time then maybe you could give it a go. 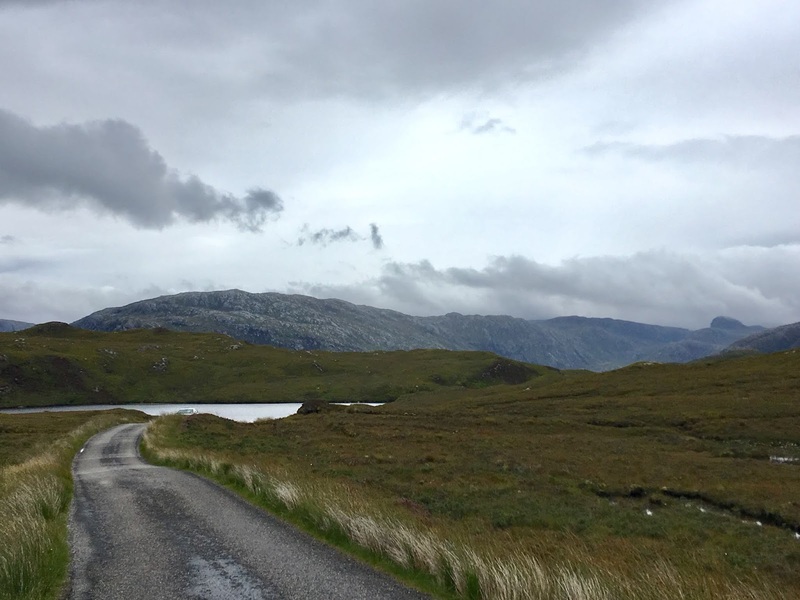 We continued along the coastal road to Lochinver which we reached at around lunchtime. We had heard lots about Lochinver Larder and their world famous pies, but unfortunately due to it being a Sunday they were shut. We couldn’t check into our accommodation until 4pm so we decided to take the B869 via Drumbeg. 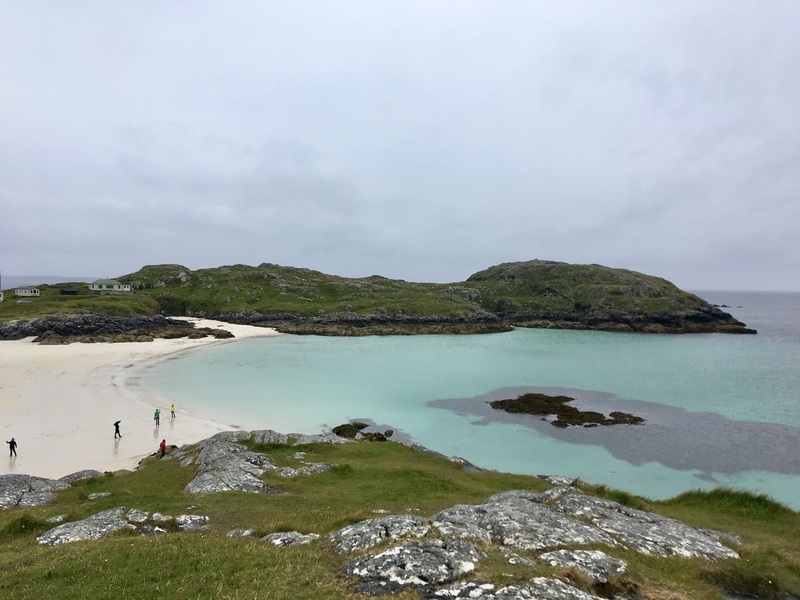 The first stop on this road that is most definitely worth visiting is Achmelvich beach, the water is so turquoise you could easily mistake it for somewhere slightly more tropical than the Scottish highlands. We made a quick pit stop at the Drumbeg viewpoint which is quite spectacular and you can see 35 separate islands from here.. 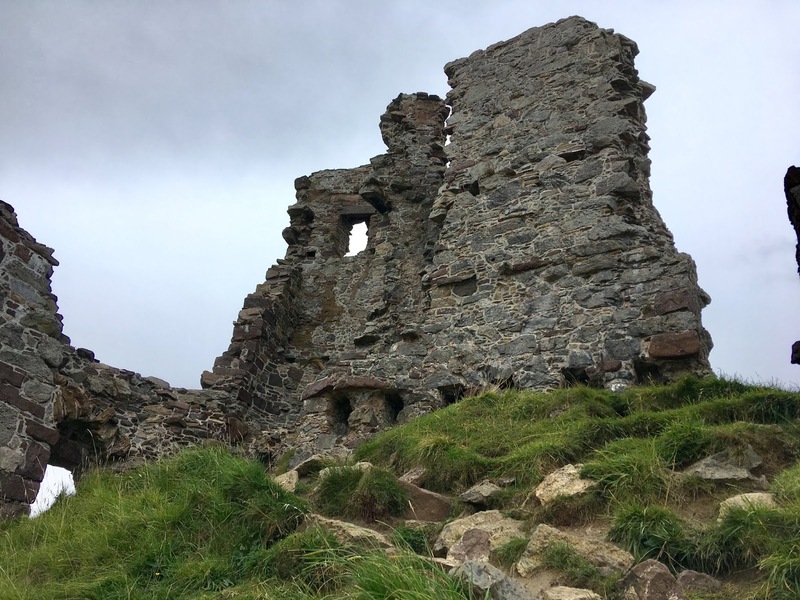 I also found a painted rock here, which I’ve taken with us to place somewhere on a highland adventure, in the hope someone finds it on their own adventures. 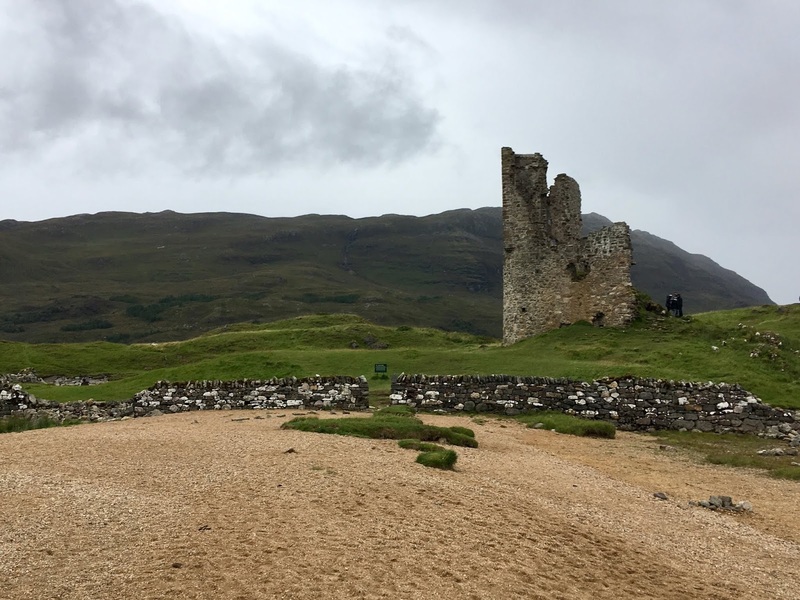 On our way back towards Lochinver we made a quick detour to Ardvreck Castle which is now in ruins. Whilst we were their the rain clouds started rolling in, which made it seem even more gloomy and desolate. Once we had all the photos we wanted, it was time to head towards the B&B to get dry and warm! The rains were really picking up by this time and we weren’t keen to head back in to town later for our dinner reservation at Peet’s. Especially because the lounge in the B&B had a roaring fire, exactly what we wanted after a cold and miserable day. Despite not wanting to go back out into town we had a delicious meal at Peet’s and if you are staying in Lochinver than you should definitely book a table. For the rest of the evening we cuddled up by the fire ready for our adventures across the North Coast the next day. Keep your eyes peeled for day 4 of our trip soon! © Natasha Audrey | All rights reserved.